Unfortunately, the title of this post is not hyperbole for an increase in the use of video in Covenant Life's Church services. We literally had an explosion this Sunday. 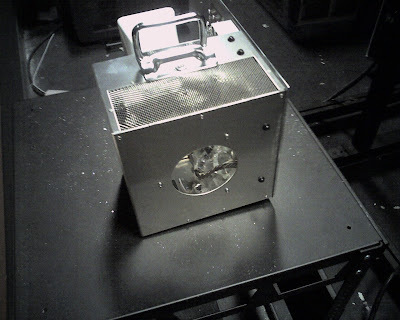 Our main video projector lamp exploded, as you can see in these pictures. 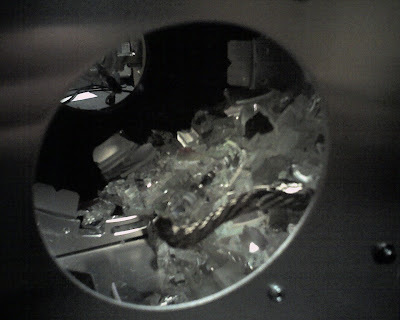 Most of the glass remained in the lamp housing, but enough of the smaller pieces came through two layers of vents to make a mess on the floor. The speckles on the black rack in the picture above are shards of glass left over after we vacuumed. This is our rear-projection screen, so the glass didn't come down on the congregation. The lamp exploded sometime between services, so we didn't have any down time. We noticed the problem early enough to fix it. Less importantly, can I expect a free replacement lamp, given that we were just over 1/2 of the expected lamp life? I am going to leave the projector manufacturer name off the post until I get to speak to the company personally. However, I will likely post again after speaking to them to let you all know how they respond. I'm disappointed, to say the least, and this incident makes me hesitant to ever put one of these projectors out over an audience for front-projection. If we upgrade our video screen systems again, we will have to go front projection, and this situation will sway me toward other manufacturers if not sufficiently resolved. Please leave a comment if you have any experience or suggestions on this. Mark Dever of 9Marks Ministries has posted his ideas on use of videos in church services. Please read it, pray about it, consider it closely, and - if the Lord leads - comment there. I have yet to formulate my response to his suggestions, but I know that his ideas challenge much of what we are doing at Covenant Life right now. Such challenges are great, as they sharpen my thinking on the topic. If you have any discussion that you want to bring to undistract based on his post, comment away. It's been a couple weeks between Reverb posts, due to Na last weekend, but it's good to be back. I want to thank Bram, Gavin, Jim, Pat, and Ken who led the tech teams during my absence on 5.25. From all reports, things went well, even if not flawlessly. Ben and I learned a lot about how to prepare for these times away. Pastor's College Graduation - isn't it humbling to see all the places God is taking Sovereign Grace Ministries? The morning went very smoothly, so thanks to everyone for all the effort involved. Here are some reverberations from the weekend (which won't be complete without your comments). Setup seemed to go well this weekend. One thought: the crew - with my approval - broke to eat dinner at 6:00p before doing a line check. While that seemed like it would be plenty of time to eat and get back for line checks, it did make the arrival of the musicians a little more stressful as they set up and we tried to run line checks at the same time. I would suggest to myself and all other teams to complete both headphone and input line checks before eating dinner. I thought the mix this weekend was great. Thanks, Dave, for making the low-end impacting but not overwhelming and for working to create a warm, full vocal ensemble sound. I think you accomplished several of the goals we've been working toward as mixers. There are dangers with having a warm, vocal ensemble sound rather than a brighter, leader-up, bgvs-behind mix. One is loss of a worship leader's vocal direction to the congregation. A couple times I thought that Mike's direction was a little hard to hear. But I don't always trust my assessments because I have a radio earbud in one ear and a headset over the other. Any thoughts from the team? Another DPA headset mic note. While the new headset mic is great, it seems to have a tendency to stray toward the back of the head. I'm not sure if this is just placement by the audio producers, or if it is actually moving when the pastor sings, or (most likely) both. But we need to get the mic closer to the corner of the mouth. It is more sensitive to plosives than the Countryman E6s, so it cannot be out in front of the mouth. But it needs to be closer or we won't get enough gain before feedback. I don't have any notes on lighting whatsoever. I did get a comment after the 2nd service that there was either a stray or "fallen" light in the worship cue. Let that be a reminder to do a visual double-check all cues on Sunday morning. All the video elements went very smoothly this weekend also. Both DVDs read correctly in the player and their playback was flawless. Thanks, team, for not rushing either the in or the out. I also want to thank Steven on camera 4 for implementing the recommendations on ministry mic pre-service setup that I wrote about here. The shots of the ministry mic were locked in so fast. Excellent! Dave, Ben, or Bram reminds team (or informs them) that someone is coming up. Camera director assigns camera to get shot. Camera operator gets shot framed and focused. Assistant director gets shot shaded correctly. Camera director takes shot and notifies house director of ready status. House director takes the shot to the main screen before his first word. If we are all listening carefully and on our A game, I think we can do this in 15 seconds. Would you agree? If so, let's make this our lofty goal: If we have a 15-second notification, we will get a perfect shot up prior to the person speaking. Please post your "whoa, wait a minute!" comments. Thanks, friends! Don't forget to share your thoughts, and do have a great week! I'll see you on Sunday, if not before.